Devi (Chennai, India) on 30 November 2016 in Animal & Insect and Portfolio. Great shot! Great light, details and textures. Ha ha...all own pace huh? The picture tells a story. Gran captura, del lindo caracol... Bonito color y luz. ***** Felices días. ..... And also finished the race ! !, attractive action!! photo. Finally crossed the finishing line ! He is out of his usual place, he is brave. Very great shot. Good light and reflections. @Graciel·la (Vic. Catalonia): Yes Gracile-la..he is far from the plants..in an unknown land !! Beautiful capture of him !! Grouser stole my thunder!! He does look like he's crossing the "finish line" first! :) Champion du saut en hauteur ! Ha ha...not one to follow the marked trail. @Robert D. Burr: yes...the wild one ! Wonderful capture with a nice title. 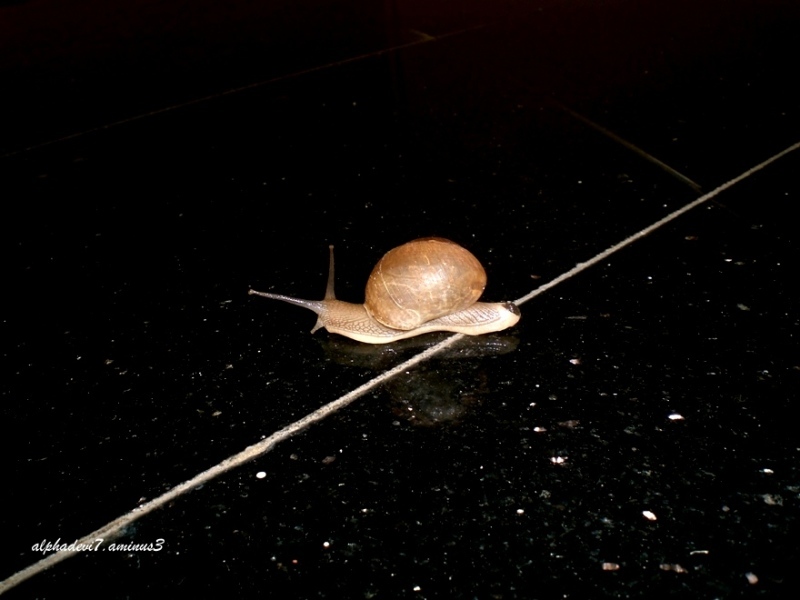 Quel escargot qui passe cette ligne génial. Brilliant shot Devi! The light was just perfect, like the snail is aglow. A very good close up of this less-than-speedy fellow. Surprising just how far they can travel when the mood takes them ! looks like, she is in a hurry ... great shot! @Nina: May be she wanted to get back to the garden! Wonderfully framed and I love that subtle reflection!! @Ellebelle: Thank you Ellebelle... I do admire your snail shots so much !! !